Adidas is the shoe sponsor of the Boston Marathon, but don’t tell that to New Balance. Once again, the local shoe company is plastering streets and transit stations with a new marketing campaign timed to the Marathon. New Balance’s 2015 campaign, “Nobody Runs Like Boston,” plays off the city’s running heritage and culture. This week, the Brighton shoe manufacturer will take over the MBTA’s Park Street Station and bus shelters throughout the city with advertisements. 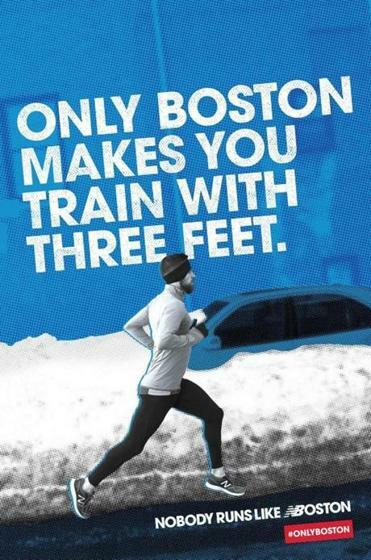 The ads will feature taglines such as “Only Boston Makes You Train With Three Feet,” alluding to a historic snowfall this winter, and “Only in Boston Do A Million People Take The Day Off So 30,000 Can Work,” making light of Marathon Monday’s holiday status. The company is also releasing a limited-edition version of its Fresh Foam Zante shoes. They will feature the Boston skyline printed on the insoles and the word “FASTAH” on the soles. The shoes, $115 a pair, will be available Monday at select stores. Advertisements will also appear at the Prudential Center, outside of Fenway Park, and in a social media campaign that asks people to post their #OnlyinBoston references.